I’m excited to be reading Peter Johnston’s Opening Minds and joining the #cyberPD conversation hosted by Cathy Mere, Jill Fisch and Laura Komos. If this wonderful book is on your summer reading list, please join us! Check out Cathy’s blog for more information or follow the #cyberPD hashtag on Twitter. And if this book isn’t on your summer reading list…I strongly suggest adding it! Here are my reflections on Chapters 1-3. When I read Choice Words (Peter Johnston’s first book) eight years ago, it changed who I am as a teacher. I remember reading it. Then reading it again. And again. It was a little book that was jam packed with “a-ha moments”. I felt as if I got something new from it every time I read it. (I still do, which I why I reread it every summer.) I started a teachers as readers group at my school to talk about the book and kept referring back to it. I wanted to internalize all of his wonderful words and wisdom. I was extremely lucky to be invited to a small group lunch with Peter Johnston at NCTE in 2005. I remember what he shared with the table – he told us to feel free to make “cheat sheets” – to write down the phrases, language and responses from the book that we wanted to internalize. He told us to use the cheat sheets until the language became a natural part of our teaching. I recently found those cheat sheets in a file and was amazed at how much of that language is just a part of who I am in the classroom. I really did internalize and now own a new way of thinking, talking and teaching. I am so excited about Peter’s new book and I am starting my new “cheat sheets” for next year after reading the first three chapters of Opening Minds. At the top of my “cheat sheet” is the word, “yet“. What a powerful word it is! Imagine what happens when a child says, “I’m not good at this.” vs. “I’m not good at this, yet.” I just love the sense of possibility that the word “yet” generates. It opens up so many opportunities, rather than shutting down the learning. Working with kindergarteners gives me a huge opportunity to help them create themselves as learners. Johnston talks about how “for us to have agency we have to believe that things are changeable, because if they can’t be changed, taking action is futile.” (p.27) I want my students to see themselves as “can-do kids” – kids who can make a difference in their learning, their lives and the world. Choice Words talked a lot about agency and Opening Minds layers bold new thinking on this idea. Next on my list is, “thanks for teaching us that“. (p.32) I often ask my students “how did you do that?” or “how did you figure that out?” and then I ask them to explain and share with the class. But I love how ending that conversation with “thank you for teaching us that”, rather than with praise, empowers children and positions them as another teacher in the classroom. My third word on my cheat sheet is one I want to eliminate, the word “smart“. After reading Choice Words, I immediately stopped using the term “good” – as in “good readers/writers/mathematicians” because by saying someone or some action/behavior was good, I felt that it was implying that someone or some actions must be bad. Johnston illustrates, and shares research on why using the word smart, and telling children “you must be so smart”, really do the same thing. (p.9-10) It implies that you are either smart or dumb, which is a fixed characteristic that doesn’t leave a lot of room for learning, growth or facing challenges. I grew up thinking and saying (often) that I was dumb in math. Recently, I’ve changed that fixed theory and embraced learning and teaching math. Thanks to many great mentors, professional texts and workshops, I have come to see math as a fun challenge to teach and to continue learning more about. I even started my summer with a 2 day math workshop! I realized that my fixed idea about being dumb in math wasn’t serving me or my students. I don’t want my students to stay in a fixed mindset about anything in school, or beyond. Johnston says, “when children holding fixed theories encounter difficulties, mistakes become crippling.” (p.11) I want our classroom community to be one where people take risks, attempt challenges, make mistakes and learn from all of these things. I want them to see that “when you run into difficulty it just means things are becoming more interesting. Challenging activities present no threat, only the promise of learning something new.” (p.12). Imagine how exciting, interesting and fulfilling learning and teaching would be if that was our thinking! I am looking forward to reading the rest of this book, probably multiple times, and reflecting on my language as a learner and a teacher. Please join in our discussion in the comments section here, on any of the host blogs mentioned at the beginning of the post, or on Twitter. Check back in the next two weeks for posts on the rest of the book. 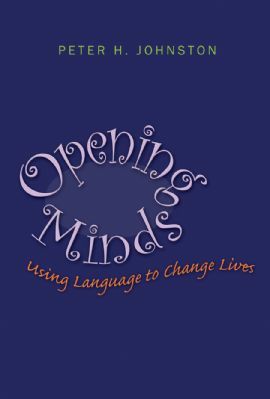 If you are interested in reading Opening Minds or Choice Words, both books are available at Stenhouse for 20% off during their Blogstitute Event, along with free shipping. Just use the code BLOG when you order online. Peter Johnston is a featured author for the Blogstitute, so look for his posts on the Stenhouse blog site.